Many people who are born into female bodies are taught from a young age that “good girls” do what they are told, are mild mannered and cautious. The Bad Girls* Bike Club would like to challenge the notion of what it means to be a “good girl” (or a girl at all). The asterisk represents all communities that don’t benefit from the white cis male privilege that is prominent in the cycling industry. BG*BC is open to all bodies and is trans, non-binary, and femme inclusive. We want to create a culture that enables women, trans and gender nonconforming people to be boisterous, adventurous and to take up space. 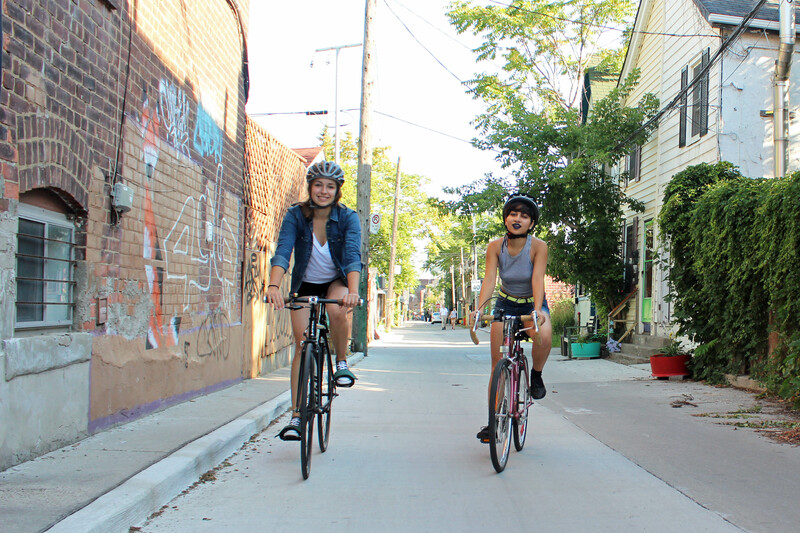 The Bad Girls* Bike Club is a Toronto-based cycling group for women, trans and gender nonconforming people. Our goal is to create safe space for marginalized communities in an industry that has historically been overwhelmingly male, white and cis-gendered. We’d like show people that not only is urban biking one of the most efficient ways to get around, it can also be incredibly fun and empowering. Cycling is something that a lot of people can do—and you don’t have to be a spandex-wearing athlete. In the spring and summer we run weekly beginner-level group rides that are casual and slow-paced. We also run bike maintenance workshops throughout the year at Sweet Pete’s Bike Shop in the Annex (517 Bloor St. W).